Hey, Faraday is ‘Pick of the Week’ over at Webcomics Alliance. Check it out! 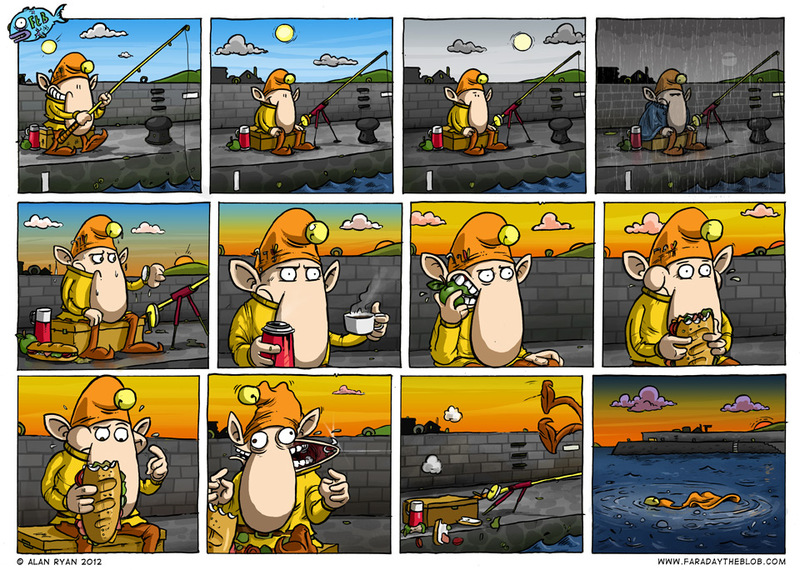 This entry was posted on Monday, April 16th, 2012 at 9:00 am and is filed under Comics. You can follow any responses to this entry through the RSS 2.0 feed. You can skip to the end and leave a response. Pinging is currently not allowed. Ha! You should have had elf see some money and grab it, and the money was attached to a fishes fishing line? Bearman - Patience is a virtue in fishermen! Abban - Elf has fallen for that one so often I never even bothered to make a comic about it. Seriously a dozen times or more. He never learns. It took me some staring at the panels but then I noticed that after the rain there was a sandwich on the dock that hadn’t been there before and our fisherelf had taken a couple of bites before he stopped to consider- where the doo-dah did this come from and – badaboom – the most energetic hook set I have seen and our friend was whisked away. Hope he considered undersized and thrown back. love the time lapse in the panels. Your comics are just stunning, and funny to boot. This particular specimen too. That’s a class strip! V subtle… Only got it when ol gui spilt the beans! Gah! At the end with no more comics…. I’d better make some more so!